Thursday 28 February - Good morning New Orleans, hello winter in the city by the gulf. We had a light breakfast at the club lounge and went off to meet with Janet and John Morrison. They joined us and we went in search of the Gray Line tour center which opened at 10am. We booked our river cruise for Friday and were informed that the Swamp boat river cruise was closed and was closed since the hurricane. Not good; so we had to regroup and we decided to go to the New Orleans National aquarium for the afternoon. But prior to going we stopped at Chico's to purchase jeans and a sweater for Cindy, she had not packed any warm cloths and the temperature was to drop to 38. Cold in the city; also dropped in a restaurant and had a small lunch. After the Aquarium we purchased a trolly ticket and rode about the city and the full length of Charle's Street. We returned to the Sheraton Hotel and went to the club lounge for heavy snacks and wine. After an hour or so we decided to not go a have diner. Friday 1 March - where are the sunny skies? Gosh it is chilly! Janet and John joined us at 9am and we were off shopping for goodies and walking slowly to catch the river boat for a cruise on the Mississippi River. The full Cruise Addict group boarded the riverboat as a group and enjoyed seeing each other. The group enjoyed the trip and agreed to have diner together at Pat Obriens restaurant. We spent the remainder of the afternoon walking the streets of the French Quarter of New Orleans. Saturday 2 March - We're off! We left the hotel at 10am for the very short trip to the ship terminal and the Royal Caribbean "Navigator of the Seas." We boarded in less than 15 minutes and were walking the ship halls by 1045. however, we could not go to our rooms until 1300 and the only place to wait was the main gallery. The skies continued cloudy and the temperature continued in the 40's and the wind gusting over 20mph. The trip down the Mississippi is 110 miles; about 8.5 hours of sailing. Wow what a journey!! The Cruise Addict group all joined at their respective tables and the main dining room. 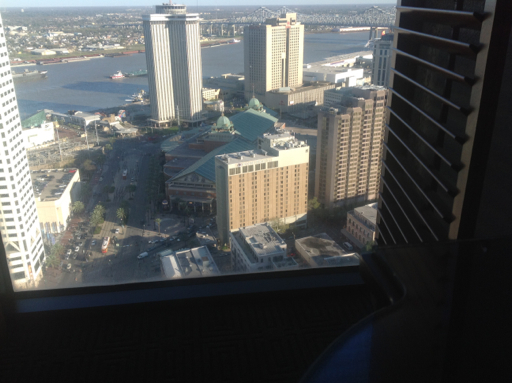 This was the view from the 45th floor room we were staying in. To the right you can see the cruise terminal. Good morning one and all, we are in Grand Caiman this morning and it is bright and sunny. But there is nothing Ed and I want to do in town so we have chosen this day to stay on board. And I will try to catch up on the blog. When we left, New Orleans we left late, so we didn't get to see much of the Mississippi going out, that was really too bad, and it will be dark when we come back in too. :( Oh well such is life. it was still very cold that night and the next day also, that was a sea day so other than getting used to the ship we didn't do much, except the gift exchange. We managed to draw a good gift, a small first aid kit, that you can take in the water or on a boat, and it stays dry, cool. And we needed small as we have no room in the two suitcases we brought for anything of any size. So my shopping has been limited! Formal night was nice, the picture were awful, and I thought the photographers on Princess were bad, these were worse. Yesterday the we arrived in Cozumel and it was going to be warm, it was beautiful, we had a wonderful day, walking the streets and shopping. We didn't buy much, but we had a great lunch in a Mexican restaurant, and saw lots of things we didn't need nor want, but it was nice and balmy and that was enough for the four of us. Janet got a bracelet, that she was looking for, I didn't find anything except some of the charms they give away to get you in the store. 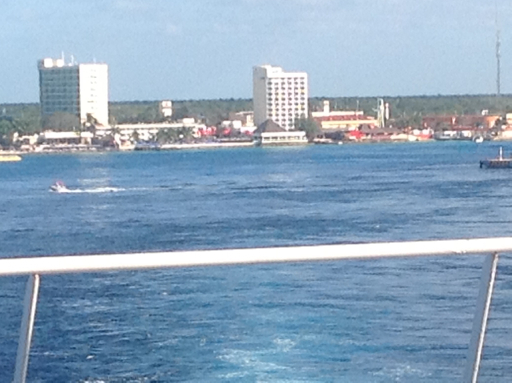 This is the view as we left Cozumel, it was still really pretty. So today we rest as tomorrow will be VERY busy, we go to the beach, at the Hilton in Falmouth, and when we get back to the ship, we will have to hurry and go to the mystery theater dinner we have booked so until later I bid you all Aude.